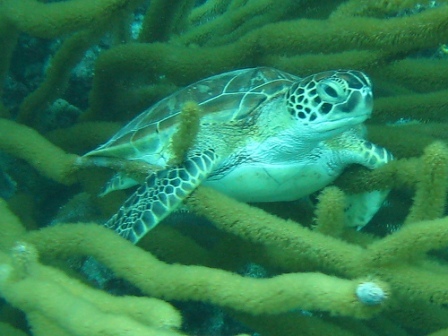 Green turtles are part of the biodiversity of coral reefs in the Caribbean. These green sea turtle pictures take you into their underwater world. Green sea turtles are herbivorous (they eat plants) reptiles with an adult population that survives on marine plants such as algae and sea grass on the coral reefs. However, juvenile green turtles love to eat sponges, crabs and jellyfish. Unlike its other relatives this turtle cannot pull its head into its shell. They can weigh up to 400 pounds(181 kgs) and can grow up to 4 feet(1.2 metres)! Their average lifespan is 80 years, unfortunately, this species is endangered due to multiple predators of the green turtle hatchlings including vultures and crabs. Contributing to their endangered status, adult green turtles are captured for their meat and eggs. 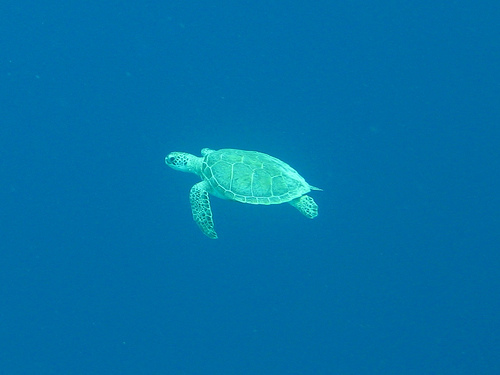 In addition, decreased numbers of green sea turtles are caused by boating accidents, accidental fishnet entanglement and nesting site disruption by humans.